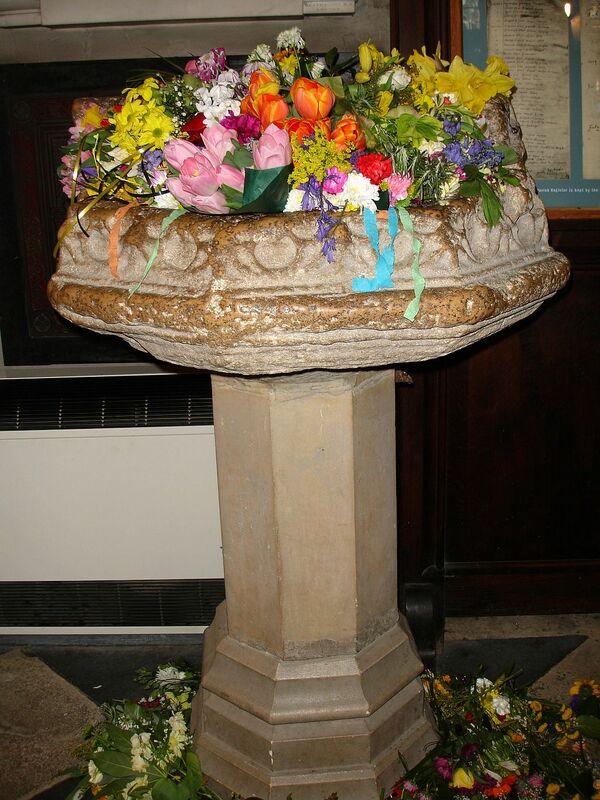 Saturday 26 April 2014 is the 450th Anniversary of the baptism of William Shakespeare in Holy Trinity Church, Stratford-upon-Avon. Doubts may be cast over his exact birthday, but there is no debate about the exact date on which he was brought by his parents and their friends to be baptised in the ancient font that can still be seen in the church. By great good fortune, this year the 26th falls on a Saturday. 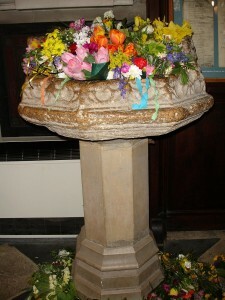 It was decided many years ago that the formal Birthday Celebrations should be held on the nearest Saturday to the 23rd, so this morning thousands of people will bring their floral tributes to the spot where we know that Shakespeare’s birth was formally celebrated on 26 April 1564, 450 years to the day. The baptism record in Latin, “Gulielmus filius Johannes Shakspere” still exists, though the record is a copy made around 1600 from the original. Regulations had been introduced in 1598 by which all parish registers recordings births, marriages and burials since the beginning of Queen Elizabeth’s reign in 1558 should be kept on durable parchment rather than paper. Once the records had been transcribed into the beautiful leather-bound volume which bears the date 1600 on its cover, the original records were then discarded. The fact that these records are still in such good condition confirms that the decision to have these records transcribed by copyists was the right one. This entry was posted in Shakespeare's World, Stratford-upon-Avon and tagged baptism, Holy Trinity Church, parish register, Shakespeare Birthday Celebrations. Bookmark the permalink.